The Silk Weaver’s Wife – An intriguing story of two women! 1704: Anastasia is desperate to escape her controlling and volatile father and plans to marry in secret. But instead of the life she has dreamed of, she finds herself trapped in Venice, the unwilling wife of a silk weaver. 2017: Millie wants more from her relationship and more from her life. So when her boss Max abruptly ends their affair, she takes the opportunity to write a feature in Italy. Staying in a gorgeous villa, Millie unexpectedly falls in love with the owner, Lorenzo. Together they begin to unravel an incredible story, threaded through generations of silk weavers. 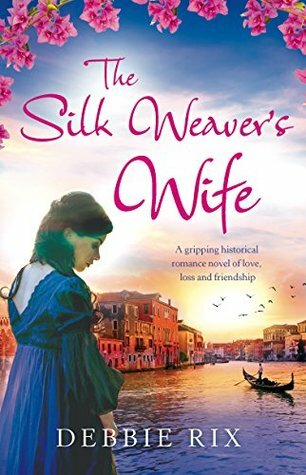 A gorgeously written, richly evocative story, The Silk Weaver’s Wife is perfect for readers who love Kate Morton and Gill Paul. The Silk Weavers Wife is a well-written story, set in Italy and which tells of two tales set almost three centuries apart. The story revolves around 2 women, Anastasia and Millie, both strong and well crafted characters, who prove to be an inspiration for all. Anastasia is brought up to be respectful, proper and do as her father says. Along with her younger sister and mother, they live in constant fear of her Father’s moods and hate. He only ever seems to show his love to his dog and the horses. Anastasia develops an interest in art and secretly tries to pursue the same. When she is taken away from the man she loves and is forced to marry someone her father had made a deal with through his gambling, her life takes a turn for the worse. Forced to lead a life she doesn’t want, she finds solace in her maid, who helps her find a way to escape the abuse and eventually find her way back to the man she loves. However, even this road is not smooth and is filled with learning and a journey of self-discovery, as well as healing. Anastasia travels across Europe and then to London where she learns to improve her art and then to apply it to the finished product of silk weaving. Jump ahead to the current day scenario and we meet Millie who has come down to Italy to write a feature on Silk Weaving and how it has evolved over time. Ironically, this trip also proves to be one of self-discovery and developing a sense of respect of oneself. She develops a bond with Lorenzo, the owner of the villa where she is staying and his charming daughter. Millie learns to deal with her failed relationship with her boss, a married man, and as she researches more into the subject of her article, she digs up information pertaining to Anastasia. As connections are made with the past and parallels are drawn, the author takes the reader on an interesting adventure. In many ways, the journey of the silk worm relates to the journeys led by both women they they finally discover who they are meant to be and learn to be content with their lives. The story moves across time as it unravels, going back and forth to give us a complete picture. The characters are well developed and deep, with the supporting characters playing major roles and contributing to this beautiful tale.